Let’s blend the holiday season, shall we? 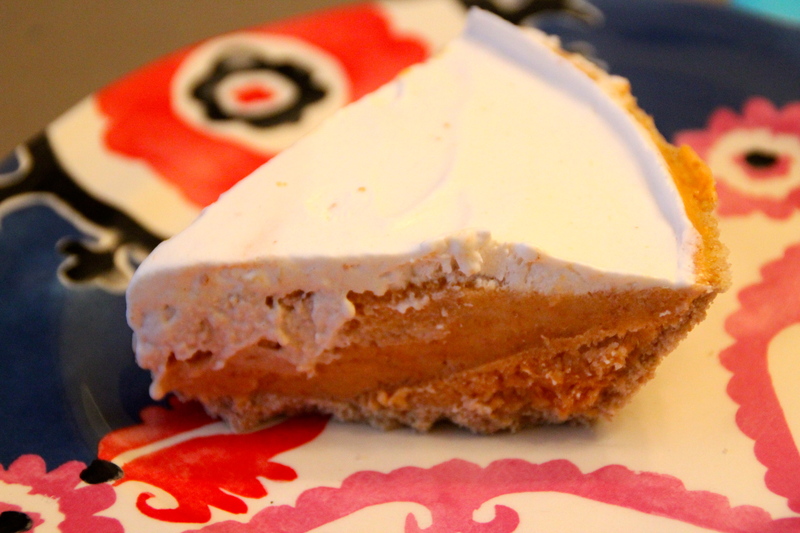 Eggnog pumpkin pie. Thanksgiving is almost here, hooray. I can’t wait to make my vegetarian “stuffing in a pumpkin.” It’s been two years since I have made it and I’m bringing it back. Then one of my favorite times of the year. Egg Nog season. LOVE IT. Decided to blend the holidays in this dessert. 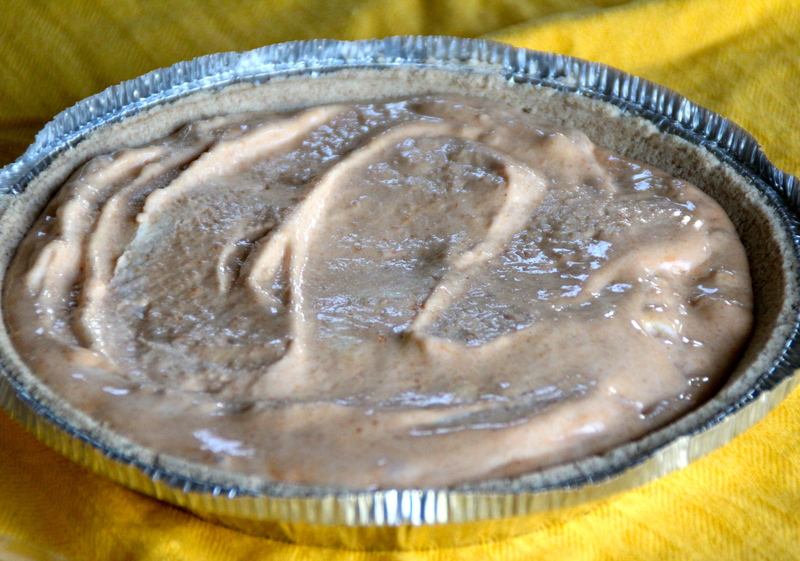 Vegan Eggnog in my pumpkin pie? One caveat to this recipe. After it is baked, it needs to set in the refrigerator over night, so plan ahead. But seriously, the recipe itself is so dang easy, who cares if it needs some chillin time. 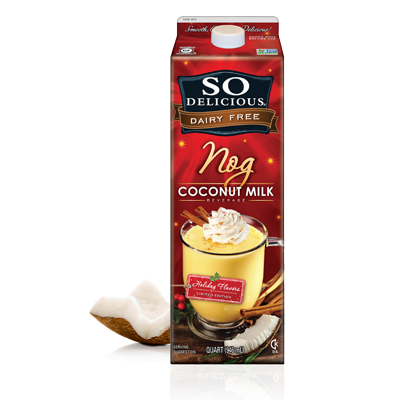 Love the dairy-free egg nog brands out there. In this recipe I used So Delicious Nog, but they are all pretty great. 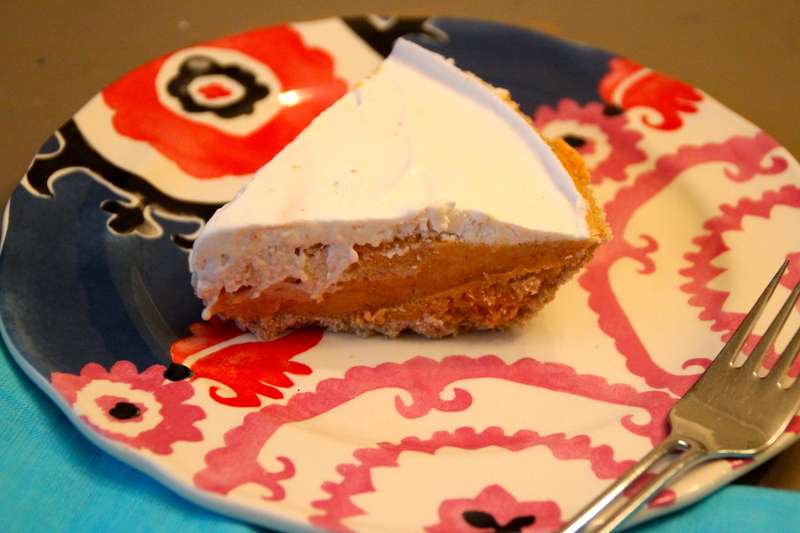 This pie has no egg and does not need much additional sugar because of the sweetness from the Nog Coconut Milk. 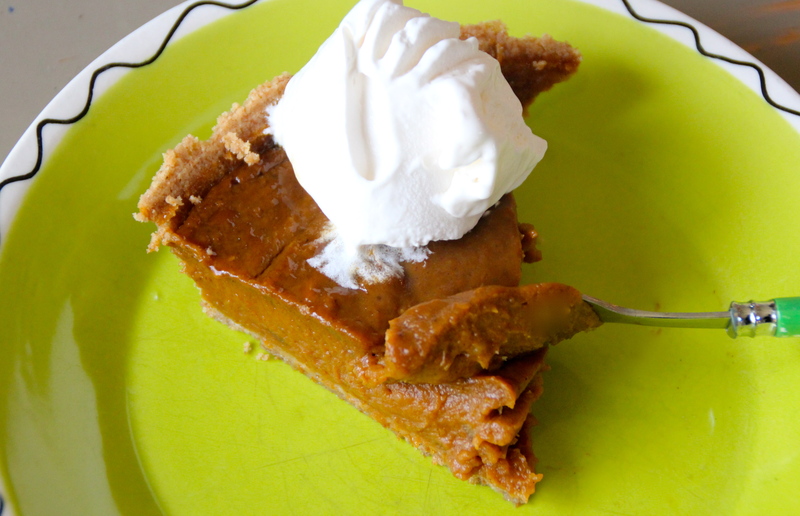 I also love that in this pie I was able to use molasses. Remember that molasses is a great source of calcium?? In large bowl, use a hand mixer to blend all ingredients until smooth. Pour into crust. Bake 10 minutes. Reduce oven temperature to 350°F; bake until filling is set, 45- 50 minutes. Set on wire rack to cool, then refrigerate overnight. I’m home. One last piece in the fridge. It’s mine. Need a fast meal idea? And this salad doubles as a meal. And it only has 3 ingredients…(or 4). 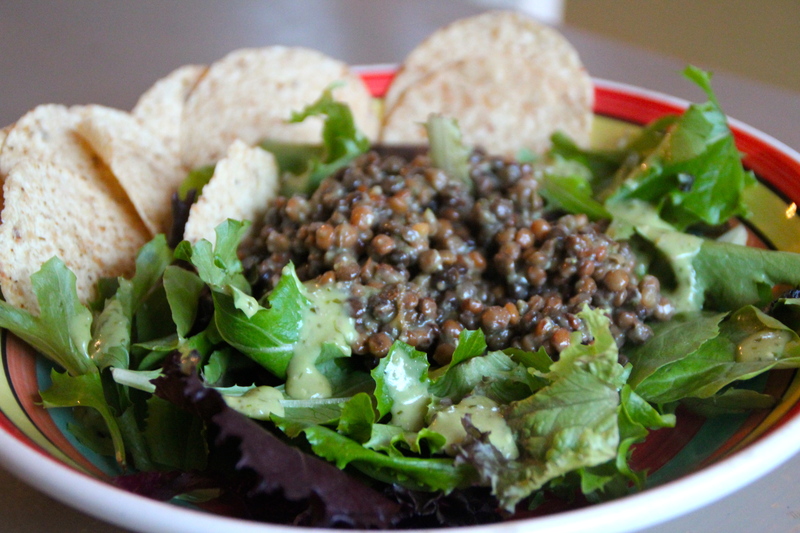 Lentil and Mixed Greens Salad. The optional “4th” ingredient: Tortilla chips on the side, but with chips? Highly recommend! 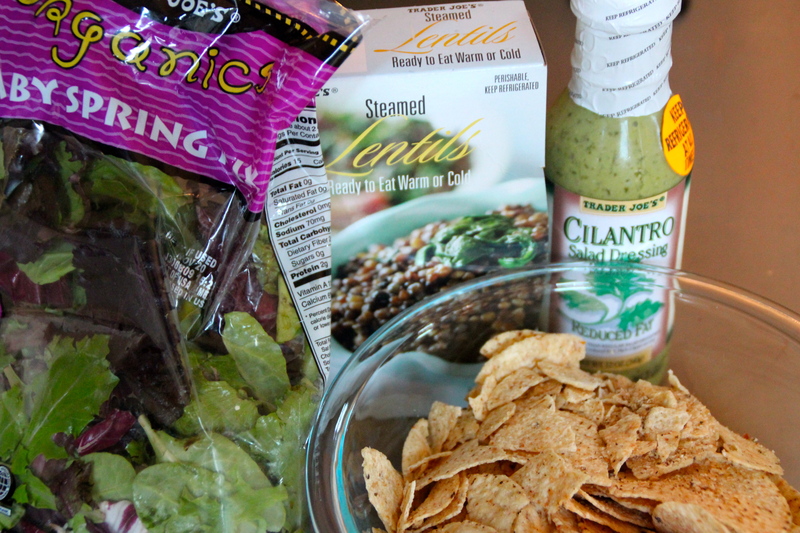 Yes, these are all Trader Joe’s products, but they sell all of these things elsewhere. No excuses! 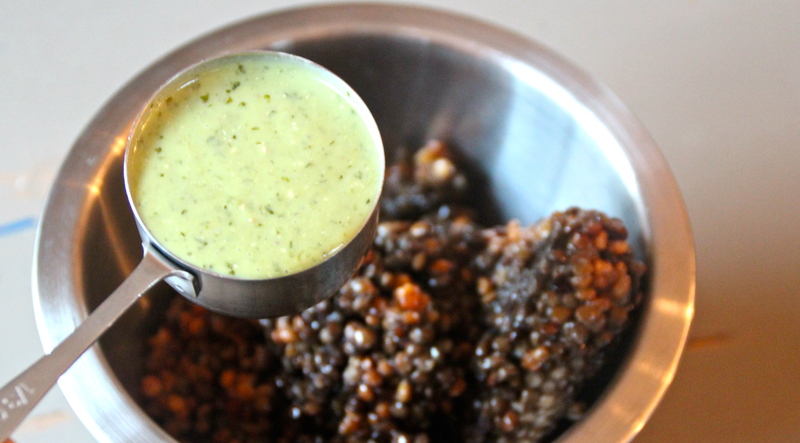 Stir in 1/3 cup dressing into your lentils. 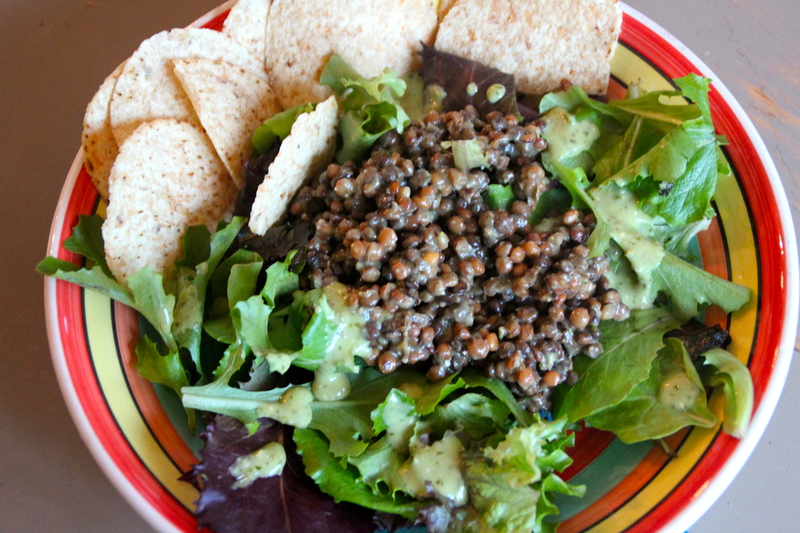 Place lentils on your mixed greens, drizzle with a bit more dressing. Add your chips. So I do realize that with any dessert you have to be careful with the claim “healthy”. I do believe dessert is dessert (not an apple for crying out loud) and this family is big on dessert. Really I try to just find a healthier way of doing it. So while I know that having a fruit salad for dessert is the best choice, who the heck does that?? Maybe someone on a diet. But, this is not a diet blog. This is just a simple family blog, with healthier options, typos and all. Healthier versions of everyday things. 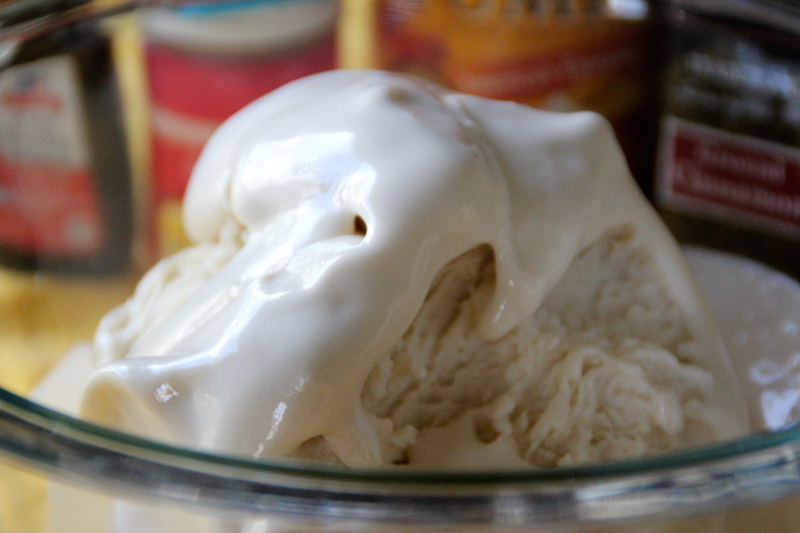 That said, this dessert is awesome and I make it with dairy-free ice cream, but you can choose your favorite vanilla. I hadn’t made this one in a little while but figured it was time. A family fave! 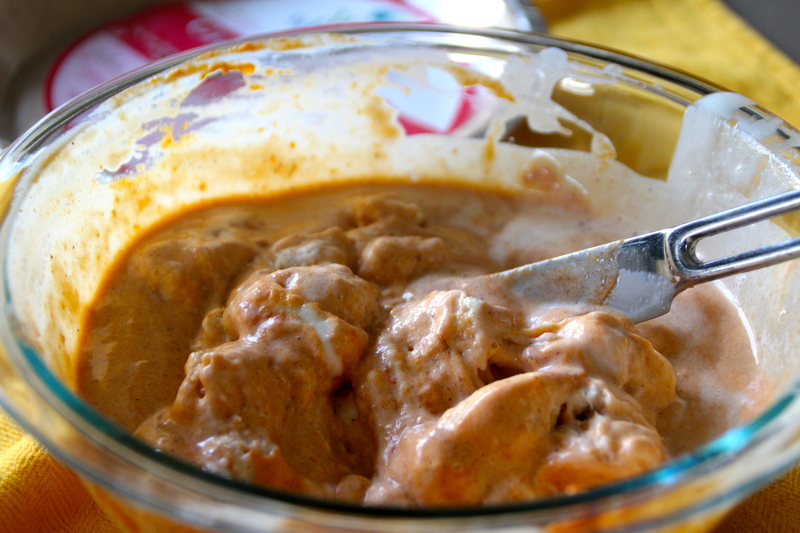 Also, this recipe is another great way to get pumpkin into your family. No Thanksgiving required. Make this year round. Why? Because it has ice cream. And why? Because pumpkin is good for you. 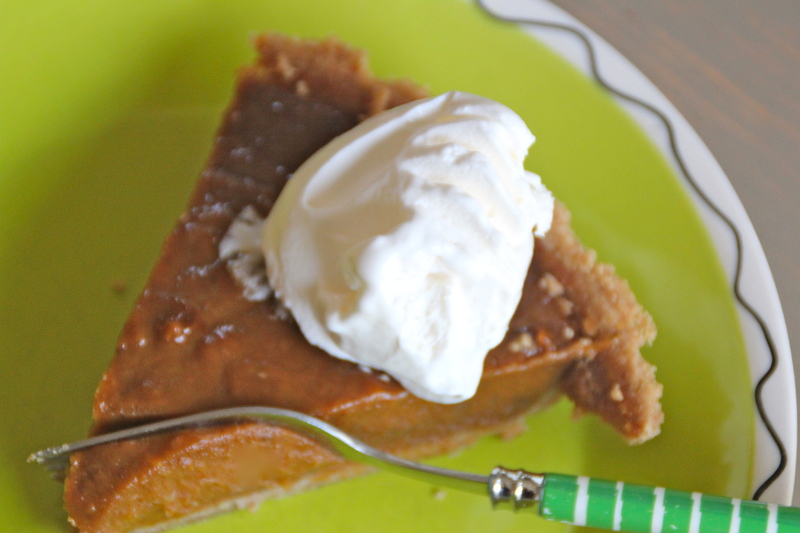 Pumpkin Pie Ice cream. Anything with ice cream is just great. Start with your softened ice cream. Add your pumpkin and spices. Add it to your crust. Re-freeze for a couple of hours and you’re in business. 2) Stir in pumpkin, vanilla and spices until well blended. 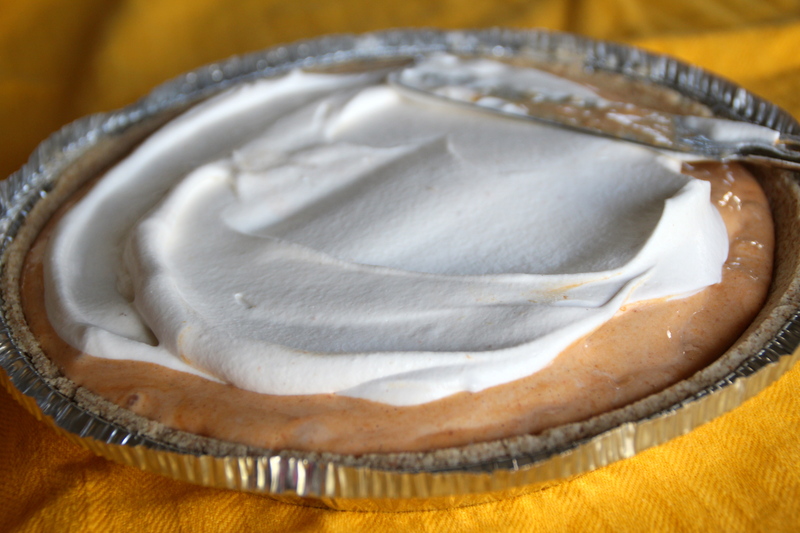 3) Spread whipped topping along the top. 4) Pop it in the freezer. Refreeze. 5) Sit and wait impatiently for a couple of hours. 6) Resist the urge to check the freezer 12 times. I wanted to bake something portable for breakfast. My initial thought was to do a banana bread, but my kids are hot and cold with banana bread these days. Gotta mix things up. I decided to make these cookies instead. 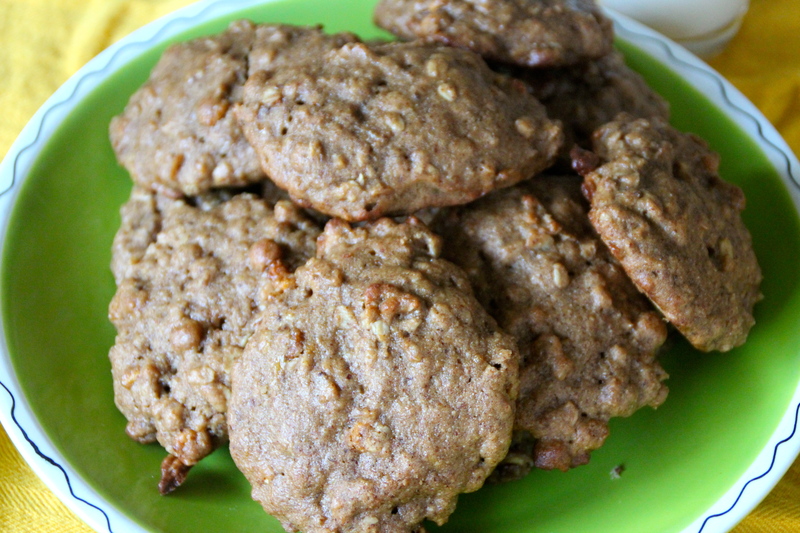 I am calling them breakfast cookies because they have whole grains, banana, and Multi-grain Cheerios. Breakfast things, right? 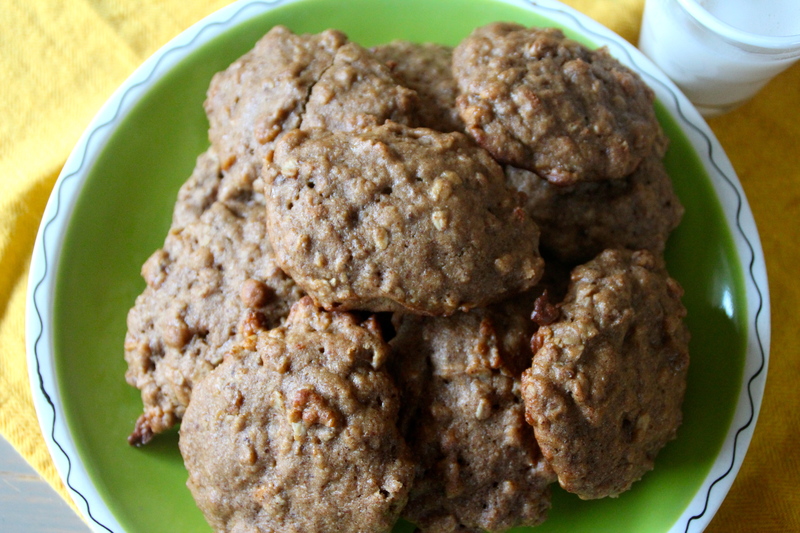 Our “healthy” breakfast cookies ingredients also include flaxseed meal and my personal fave, almond butter. Alternately, you could substitute the almond butter for peanut butter. Your taste, your call. 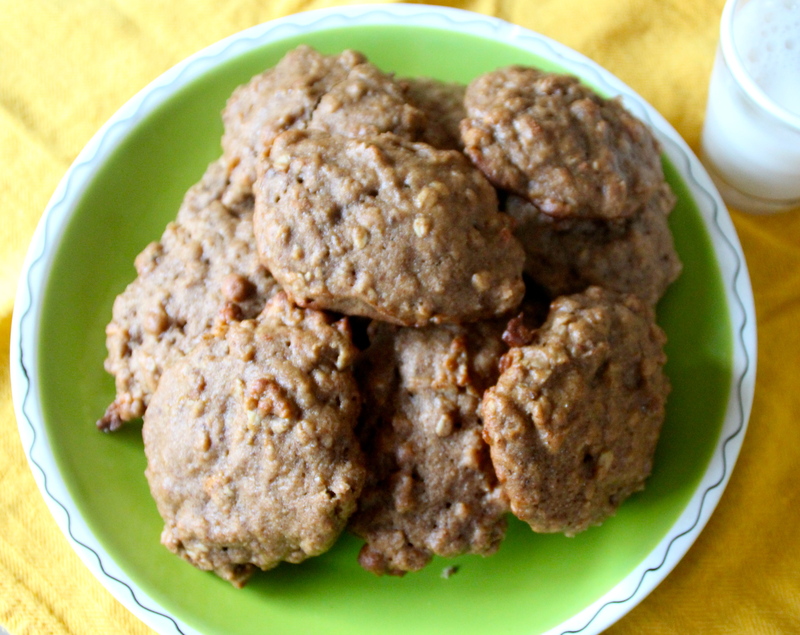 These cookies are not overly sweet, but just sweet enough that you will feel like you are having a treat for breakfast. Blend coconut oil, brown sugar, banana and applesauce together with an electric mixer until combined. (1 1/2- 2 minutes. Add vanilla and almond butter. Mix well. In a separate bowl, whisk together flour, baking soda, salt and cinnamon. Add flour mixture to coconut oil mixture and mix just until combined. Stir in rolled oats, Multi-grain Cheerios and flaxseed meal. Scoop out batter in cookie-sized tablespoons onto prepared cookie sheet. Bake for 17-20 minutes, or until edges are lightly browned. Small Changes…Leave your minced garlic alone. We all know that garlic is good for us, right? Garlic is a super star helper for our immune system, keeps our heart healthy, and is anti-inflammatory…yada yada yada. Do you know why though? It’s the allicin in the garlic that is your golden ticket to its amazing health properties. But do you know that allicin is only available to us after the garlic has been chopped, minced, crushed? However many people will chop their garlic, toss it in the pan with their oil, and go to town on their stir-fry. No lag time. So where’s the problem in this? 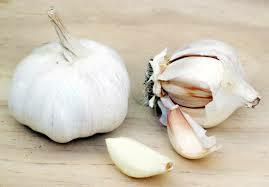 If you do not leave your garlic alone, the allicin will never be produced. Another reason to mince and walk away? When you do decide to cook them vegetables with your garlic, the allicin that is produced will be more stable and resistant to the heat from cooking. That way the health properties are not destroyed. So chop, mince and crush your garlic all you want…. But then go fold some laundry, will ya? Remember no cooking until its been chopped for 10+ minutes!